There was a point in time when you wouldn’t ever hear my name and camping in the same sentence. It just wasn’t something that I would do; I’m a city girl. There was no appeal in not having available to me all of the amenities of a luxury hotel like a running shower, toilet, and comfortable bed. However, on this trip to Morocco, I did it. 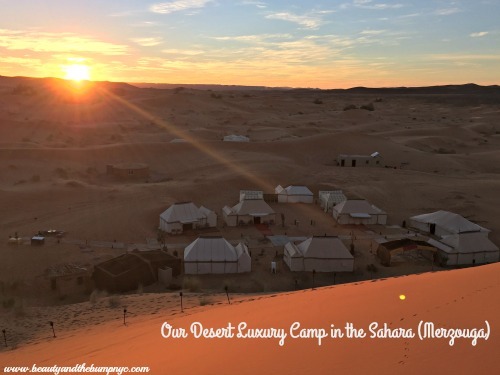 I camped in the freaking Sahara desert at the Desert Luxury Camp, and it was amazing! 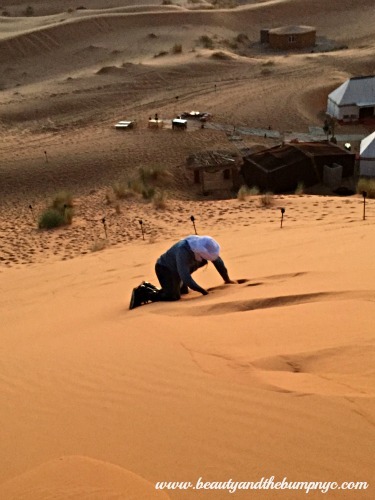 The Desert Luxury Camp is a private camp nestled between the Erg Chebbi sand dunes of the Sahara desert. 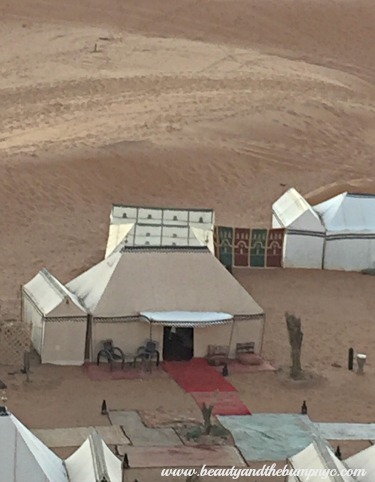 There are no other camps in close proximity, which means pure serenity while enjoying the beauty of the desert. 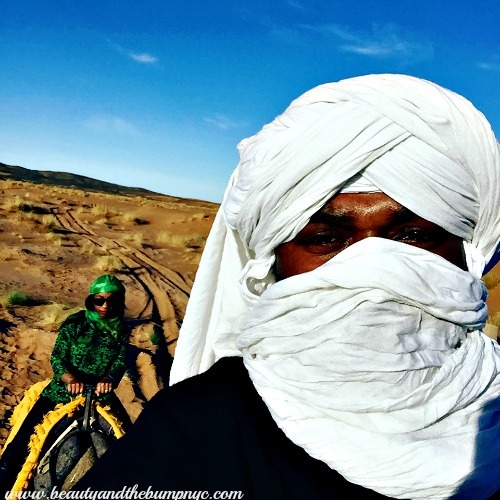 We were driven near the camp in the 4×4 we were traveling in, and had to finish the trek to the main camp on camel. Yes! On a freaking camel!!! I was about to pee my pants, as my husband laughed and enjoyed it. It seemed like we’d never get to the camp, but we did. Once we arrived, Hassan, the camp manager greeted us with warm towels for us to clean our hands. We then relaxed while enjoying [more] Moroccan mint tea with cookies and nuts. After we finished our refreshments, we were shown our tent, which was located at the main camp. We had the main camp to ourselves, which was peaceful and romantic. The camp is huge! The tents are surprisingly a good size as well. 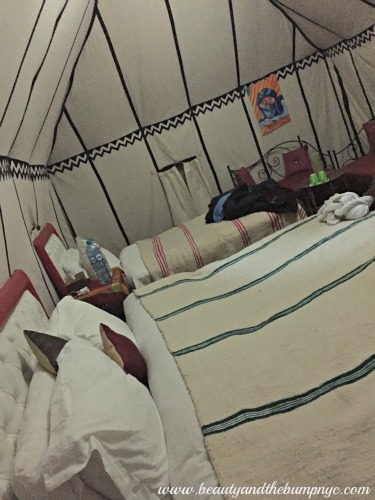 In our tent at the Desert Luxury Camp we had a king sized bed a twin bed, and seating area. We also had an ensuite with a flushing toilet, shower and sink with running hot and cold water. Having a flushing toilet in the middle of the desert was something we just couldn’t get over. Think about it: A FLUSHING toilet in the MIDDLE OF THE DESERT. Insane! 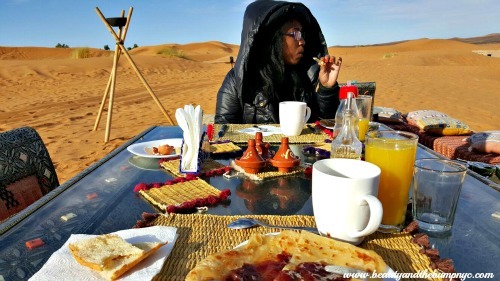 The Desert Luxury Camp prides itself on being one of the only luxury camps in Merzouga “…that offers bathroom as another tented room.” I must say, this was a delightful, and necessary surprise. The evening of our arrival we walked to the top of a sand dune to catch the sunset. I even attempted to sandboard down the dune. It didn’t go well, so I wound up scooting down on my bottom. .:Don’t judge me:. Later that evening we sat around a fire, played drums, and sat in amazement at all of the stars, shooting stars and planets that can be seen so clearly from where we were in the desert. It was nothing short of amazing. We were in awe. 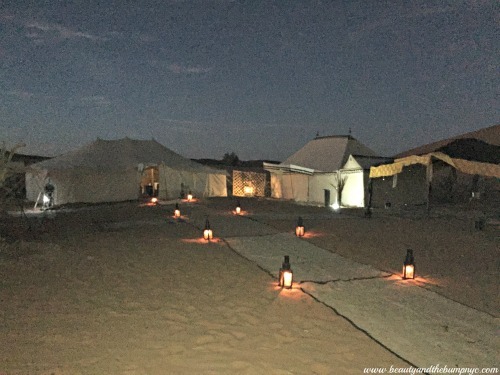 I have honestly never seen any stars shine as bright nor have I seen shooting stars, as I had while at the Desert Luxury Camp in the Erg Chebbi of the Sahara Desert. This was probably the best part of our trip. Hasan made our night even better by bringing out his iPad so that we could identify the constellations and planets using the SkyView App. If you don’t have it, download it. Dinner and breakfast were included with our stay. We learned that in Morocco, food is delicious, and a-plenty. Here wasn’t any different. For dinner we enjoyed traditional soup, beef tagine, chicken with couscous, and a dessert of fresh fruits. Breakfast consisted of tea, coffee, hot chocolate, boiled eggs, cheese, Moroccan pastries, yogurt and more. Both meals could have easily fed at least five people. The staff at the Desert Luxury Camp is pretty awesome. They made sure all of our needs were met, and were very friendly. My husband had trouble wrapping his scarf around his head, which Hassan offered to do for him. Hot water bags were provided for us during the night to ensure our warmth, and were even placed in our bed. The staff here went above and beyond, and it made our experience even more enjoyable. Staying here has definitely changed my mind about camping, and now I can add my name and camping in the same sentence. 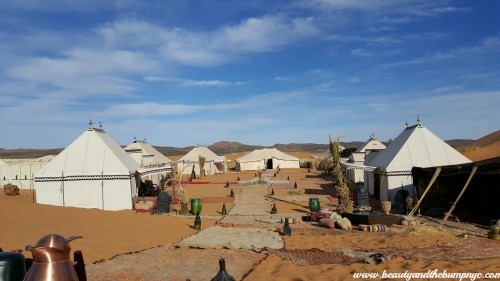 Do not leave Morocco without staying at least one night at the Desert Luxury Camp, especially if you’re into stargazing. Trust me, you will love it.